Once a month, the ratios change. TNT is concerned about the amount of Neopoints earned among all the different games and by changing the NP ratios, it is supposed to balance the game and help to keep NP inflation down. In general, if a game had a high NP ratio (requires a low score to get 1000 Neopoints), the NP ratio goes down the next month. Changing the ratios also gives all players the chance of having games they're good at have a good score-to-neopoints payout. Some games keep the same point ratio every month, like Fashion Fever, and others seldom change. On the 25th of each month. Every month. Even when the 25th falls on the weekend. Even on Christmas. It can change at any time during the day, so be careful before sending scores. The following calculators make it easy to find out how many points you need to score to get 1000 NPs from a given game or how many NPs you get from achieving a given score. How many Points for 1000NP? How many NPs for a given score? 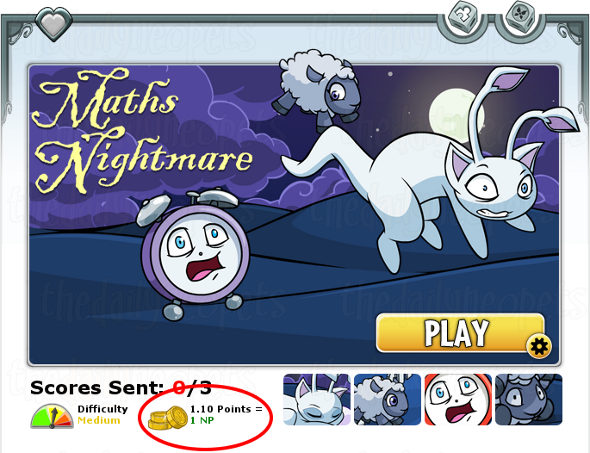 Once the ratios have changed on Neopets, we run a tool that updates the ratios on all of our game guides, and then manually update the picks on our Dailies page We try to select games that are quick to play with a good payout. Usually, everything is up to date by the 26th of the month, with things occasionally not being fully updated until the 27th if there's an emergency. It is NOT necessary to send us tickets regarding games ratios. The Snowager is awake. He'll be sleeping in 4 hours, 56 minutes.